One thing is clear: The damage done can never be erased. It’s only just beginning. This book was a wild ride from start to finish. 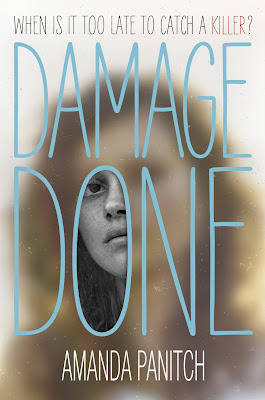 Amy Christine Parker described it as "Gillian Flynn for the YA set," and I have to agree. Like "Gone Girl," "Damage Done" makes you feel like you know exactly what's going on until a twist comes, and then you're questioning everything. I finished this book in a matter of hours because I just had to know how things would end, and I was not disappointed. When Ryan Vann bursts into the school band room with a gun, his twin, Julia, is the only one to make it out alive. Tormented by angry families and nosy reporters, the Vanns decide to leave their old life behind and start over, free from anyone who knows about the 11 victims Ryan claimed. Julia Vann becomes Lucy Black, and all the traces of her old life are gone. She has a new best friend and a budding romance. Her life is finally normal again. But when she begins seeing a man from her past around town, the illusion she's created starts to fall apart. At first you feel nothing but sympathy for Julia. She tells her story as if she's been Ryan's victim all her life. But as the book progresses and details from her past are revealed, it becomes obvious she's keeping secrets that will follow her no matter where — or who — she is. When it's revealed that Ryan, once thought to be in a coma, is awake and escaped, Julia realizes she needs to act fast before the secrets she's worked so hard to bury are uncovered. She is a wonderfully written unreliable narrator with a sinister mind you'll love being inside. My favorite aspect of this book was Julia and Ryan's twisted relationship. As you read through flashbacks and a psychologist's journal entries, it becomes clear that something is off. Their love for each other runs deep, but a twisted element to that love becomes undeniable when Ryan's desire to protect Julia turns into violent attempts to keep her to himself. Amanda Panitch ties their upbringing to the events taking place in the present in a way that keeps you guessing with every page turn. This book is perfect for YA lovers looking to get lost in suspense. Hit up your local bookstore on July 21st to get your hands on this gripping read! I've not heard much about this yet but your review has me totally intrigued. Sounds like there's a whole lot more than meets the eye. I'll be checking this one out.